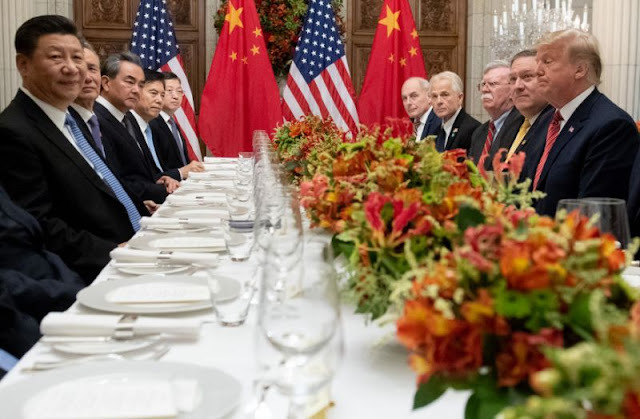 VietPress USA (Dec. 2nd, 2018): U.S. President Donald Trump and President Xi Jinping of China met face-to-face on Saturday in Buenos Aires of Argentina for a highly anticipated dinner after the G-20 Summit 2018 for celebration of temporarily halt the Trade War between two largest economies of the World. According to CNN, the dinner between the two leaders in Buenos Aires over sirloin steak, vegetable salad with a basil mayonnaise, and caramel rolled pancakes lasted for nearly two-and-a-half hours, with immediate results of the talks not known. Earlier in the day, Trump canceled a planned news conference in order to honor the passing of former President George H.W. Bush, who died Friday at 94. But shortly after the dinner, Larry Kudlow, the president's top economic adviser, told reporters that Trump and Xi's meeting went "very well." Headed into the dinner, Trump was flanked by members of his Cabinet, including Treasury Secretary Steven Mnuchin and Secretary of State Mike Pompeo. Speaking to reporters, Trump described his relationship with Xi as "incredible," predicting a successful meeting for both trading partners, while hinting there would be further talks in the days ahead. "The relationship is very special, the relationship I have with President Xi," Trump said. "And I think that is going to be very primary reason why we'll probably end up -- end up getting something that will be good for China and good for the United States." Xi echoed the President's remarks, saying the meeting is "a manifestation of our personal friendship." BBC reported that at a post-G20 summit meeting in Buenos Aires, Mr. Trump agreed not to boost tariffs on $200bn (£157bn) of Chinese goods from 10% to 25% on 1 January. The dispute broke out after Mr. Trump complained China was doing nothing to cut its large surplus in bilateral trade. At the summit in Argentina's capital earlier on Saturday, the G20 leaders agreed a joint declaration that notes divisions over trade but does not criticize protectionism. A week before G-20 Summit 2018, American President Donald Trump threatened to press ahead with a plan for raising tariffs on $200 billion in Chinese goods to 25% from 10%, while also expressing optimism that he could strike a deal with Chinese President Xi Jinping. But after a dinner post-G-20 Summit on Saturday, Dec. 1st 2018, both two largest economic countries of the World have agreed to halt the world trade war in 90 days. Investors worried about the damage of an escalating trade war with China are getting a breather. After President Donald Trump’s meeting with President Xi Jinping of China in Buenos Aries on December 1, both sides announced a 90-day pause in the trade dispute. During that time, the United States and China will negotiate a series of reforms, with neither side imposing additional punitive measures on the other. But a new deadline is coming early next year, and the end result could be the same series of escalating tariffs that CEOs and economists worry could force prices up, cut into profits and weaken the economy late in a business-cycle expansion. Trump has already imposed new tariffs on about $250 billion worth of Chinese imports, roughly half of all goods China imports to the U.S. every year. Most of those products are subject to a new 10% tariff, and Trump had threatened to raise that to 25% on January 1 if China doesn’t open its markets further and stop stealing American technology. Trump now says he’ll hold back on those tariff hikes for 90 days, as U.S. and Chinese negotiators work on terms of a deal. Markets will welcome the news, but there’s no guarantee anything will change. The 10% tariffs have been in place since September, and there’s been no meaningful progress on talks since then. A summit meeting between presidents can trigger fresh action, but if neither side is willing to make needed concessions, a deal will never happen. Here’s the conundrum for Trump: He has promised to lower the U.S. trade deficit with China and force China to open its market to more American products. But the tariffs he has chosen as a negotiating ploy harm the profits of American firms and push prices up. The stock market has wobbled this year amid those concerns, and would probably sink if Trump went from 10% tariffs to 25%. This gives Xi leverage to wait Trump out and essentially dare him to raise tariffs further, knowing it would hurt the U.S. economy. Here’s the conundrum for Xi: Trump is right about many trade abuses, a problem other Chinese trading partners also complain about. And the trade dispute is arguably hurting the Chinese economy more than the American economy right now. Yet Xi has committed to an economic model reliant upon asymmetric advantages for big Chinese firms that are subsidized by the state and benefit from protections against foreign competitors. Giving that up would force China to adapt to a new economic model, which many analysts find improbable. So the inconclusive outcome in Buenos Aries presages several more months of dodging, weaving and trying to claim victory without giving much up—by both sides. And as March 1 approaches, markets will probably start to waver again, as it becomes hard to see how either Trump or Xi can bring himself to blink.